Get Groovy with Denver CONTEST! On August 16th, 2011, Denver & The Mile High Orchestra will release their debut childrens’ project, GROOVY. To celebrate the release of the record, we’re giving away 10 copies of the album, as well as a special Skype chat with Denver to one lucky winner! 1. Comment on this page and tell us: What is the “grooviest” thing you do as a family? 2. Email us a copy of that “grooviest” thing with your NAME and HOME MAILING ADDRESS so we can contact you if you win! That’s it! So get started on telling us how groovy YOUR family is! 1 lucky winner will get a special online Skype chat with Denver of Denver & the Mile High Orchestra, as well as a copy of their new kids project, Groovy! 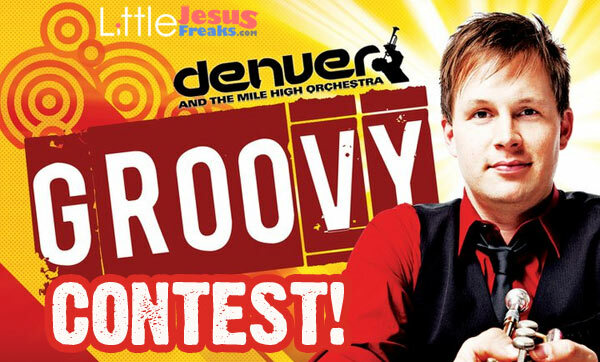 10 runner-ups will receive a copy Denver & the Mile High Orchestra‘s new kids project, Groovy! NASHVILLE, TN….April 26, 2010….Some guys give flowers and some give cards, but when you really want to get creative you start a clothing line for your wife! That’s just what award-winning musician TobyMac did after watching his wife with their children one day when the phrase just came to him…The Bomb Mom. At first he wasn’t sure what to do with the phrase, but eventually he realized it was a great name for a clothing line – a series of statement tees for all the beautiful (inside out) women who give their lives to mothering: the bomb moms. “I know for a fact that I don’t work half as hard as any mother out there,” he says. “I’ve had three to five of my kids for a day, and three hours in, I was sailing the white flag of surrender. So, I wanted to figure out a way to honor amazing moms out there.” The Bomb Mom caters to moms, moms-to-be and children, with a great range of products from stylish women’s tees, maternity tees, toddler, baby and youth tees, as well as a “bling” coffee mug and “bling” tote. All products can be viewed and purchased on the site at: http://www.thebombmom.com.